I dream I am dreaming. I know when I wake up in the dream whatever is there–whatever I see first–will be what’s important. I open my eyes and the first thing I see are the stars, a whole deep sky of them, the kind you don’t see in the city. And below is a wooden roof that is my mother’s roof in the dream, and there is some sort of art sitting on it like a fancy painted nesting box made of wood. I don’t understand it, but it makes me feel good looking at it in the quiet night. I am sitting cross-legged on my purple yoga mat in the courtyard. I sweep my arms up, my eyes following my hands in their arc. 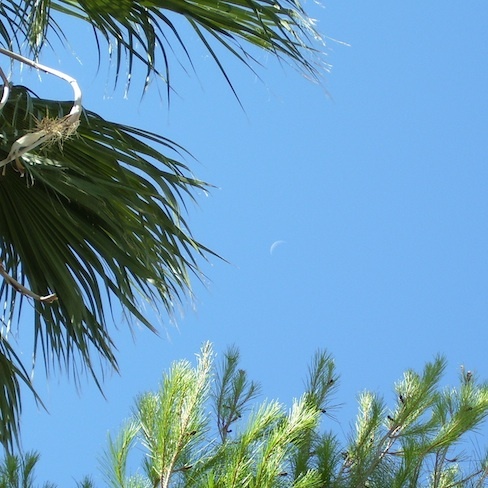 I see a thin sickle of moon framed between the big fan palm and the pine tree, white against the pale blue sky. In the act of drawing breath, of sweeping my arms up, the flicker of thought comes to me to look for the moon. I’d seen it two days in a row from under the pine tree when I filled the finch feeder with thistle seeds. And now, just as I am thinking it may not be visible, that it rises later and later each day, the moon appears. It always surprises me, the unexpected gift of it, a greeting and a message, both. Whenever it finds me, it makes me stop, brings me present, tells me I am not alone. Hello, little one. Here I am. Here we are together. It feels like divine intervention, makes me feel tended with exquisite care, the moon placed just so, my gaze angled just so, positioned and poised to receive the gift, the true present. When it happens, I feel affirmed. I am in the exact spot I am meant to be, at the exact time. I have stopped on Palo Fierro, that day the raven and the mockingbird danced across the sky, showing me the late morning moon. I have stopped on Benito Juarez in Ajijic, neck craned, blocking the narrow banqueta, my eyes traveling across the vivid fuchsia bougainvillea trailing over the orange wall to find the half moon waiting for me in the afternoon sky. The first stars in the evening feel a bit like this, too. When I walk at dusk I look for them, alert for that one moment when the sun’s light lessens its hold on the heavens and that first starry glimmer appears. I don’t know many names of the stars and the planets, but I am fond of Venus. 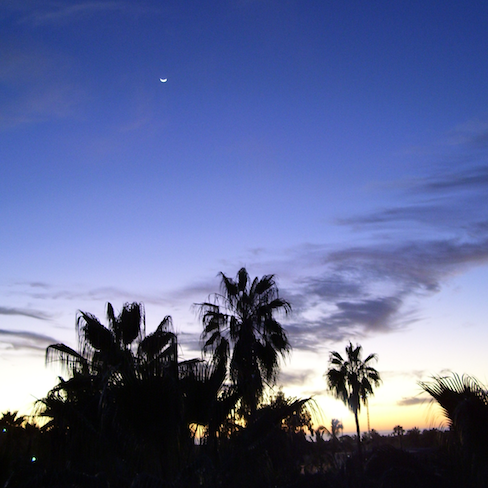 When I lived in Todos Santos, it may have been Venus who greeted me in my semi-third floor roost. I’d sit outside under the small corner of roof in a tall chair beside the low parapet. I spent all my free time up there, when I wasn’t working or out walking, feet propped on the metal railing, my world spread out below. I faced southwest. In the mornings I would lean out to the east to watch flamingo clouds, listen to the village roosters taking roll. 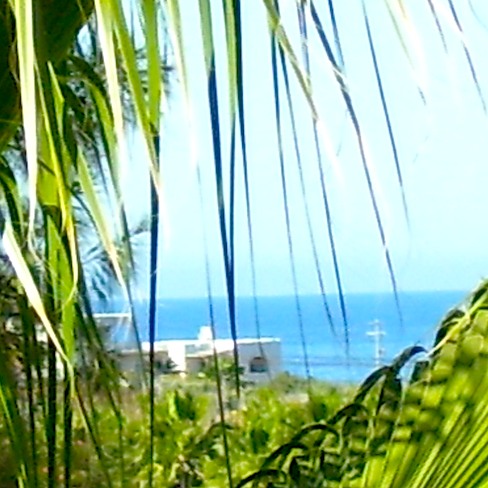 In the afternoons I’d watch the sun glint off my sliver of sea. I can’t count the evenings I sat to watch the sun sink into it, the whole Pacific ablaze. After, I’d watch my hill to the south lose its outline against the blue black sky. But before the colors disappeared, when I spotted that first big shining planet, and after I made my wish, I’d lean way out over the rebar rail, twisting to search for the other stars who made a big cross against the evening sky. I saw it once long after I moved back to the United States, but it was in the wrong part of the sky, at a strange angle, my cross but not. I want to say it is the Southern Cross, but I don’t know where that comes from, like the odd word that pops into your head when you’re working on a crossword puzzle, just as likely to be wrong as it is to be right. I discovered the long narrow cross on my own one night in Todos Santos, and I looked for it every evening after. It felt like the moon feels to me, like a companion, a familiar presence. You are not alone. It whispered to me, sitting in my perch in the late dusk or the dark of early night. And I was ever grateful, I who was so far from home in a foreign land, no firm earth beneath my feet.